Walking around Ashton market one sunny day, we happened on a stall selling old photographs – black and white, mostly, but some older, sepia toned ones too. Flipping through them, my Mum suddenly shouted. “That’s my Dad,” she cried, and picked up the photograph to make sure. It was my grandfather, and although he had died when I was about 15, I could still tell his gait, the slope of his cloth cap, and his 5 by 5 build – he’d played as a centre half for the teams that later became better known as Oldham Athletic, and the famous Manchester United, once a team of railway men and called Newton Heath. 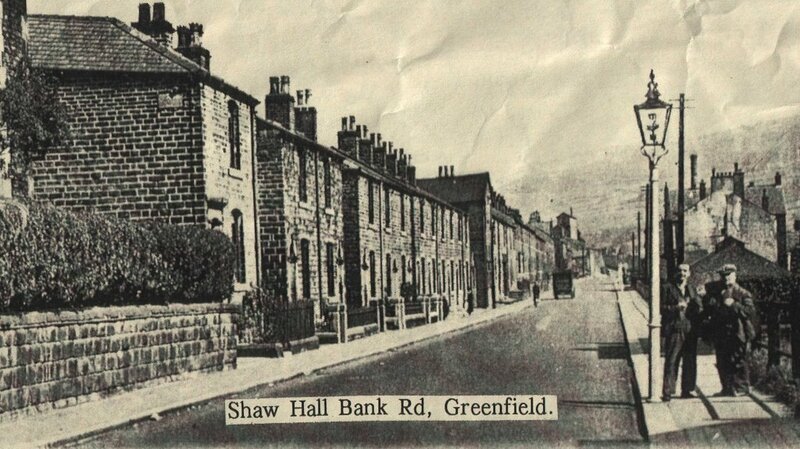 We looked at the scene, very familiar to both of us – Shaw Hall Bank Road, Greenfield, or Grenfelt, as my grandparents called the place where they had brought up their four children – David, Beryl (my mother), Walter, and Jean. Both uncles are long gone, but Mum’s well enough, and Jean’s as sound as a bell. The gas lamp went long ago, replaced by an electric arc lamp high above the pavement where the two men are seen talking. By the look of Edgar, my grandfather, he was coming home from work, taking the time to have a few words with one of his cronies from the Railway public house at the other end of the road. Living in a place where things change almost overnight, it’s odd to see a photograph of a corner that has hardly changed at all in more than 50 years or more. What will our world look like half a century from now, and will people have time to say a few words to anyone?